Riu Bambu is a friendly, fun hotel located on one of the most beautiful beaches in Punta Cana which features 560 bungalow-style guestrooms with unique amenities such as Riu's renowned minibar and liquor dispenser. 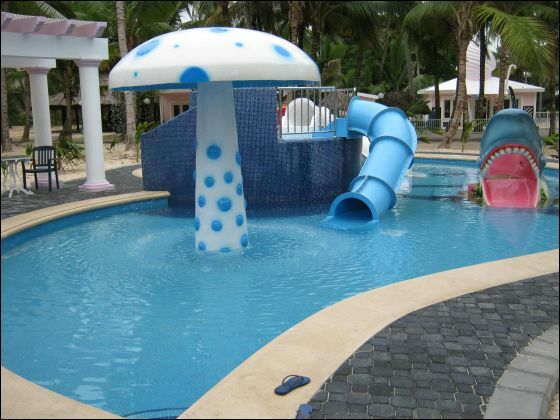 This wonderful resort offers a wide variety of fun-filled activities and sports options. Enjoy the lively atmosphere of nightly outdoor entertainment, night club and casino, while surrounded by inviting swimming pools and tropical vegetation. 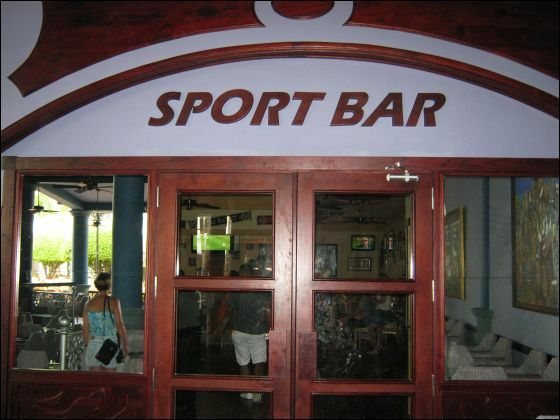 Includes a choice of fabulous restaurants and bars, plus 24 hour All-Inclusive (snacks and beverage) service. Riu Bambu will surpass all your expectations with action-filled days and nights. • For additional lunch and snacks, a free choice from a selection of restaurants at the Riu Bambu, Riu Taino and Riu Naiboa hotels. The flights: the flight was fine and the airports were good, just need to be patient with the lines. Beach: Excellent, much cleaner than some we visited down the way. The Riu entertainment staff were fun, even brought drinks to the beach. Pool: the pools are as beautiful as depicted in the travel info. Service: Could not be better, efficient, friendly and oh soooo helpful. Rooms: Spacious, clean. Only negative was the sewer odor late in the week which permeated the area. When it was windy, the odor dissipated somewhat. Would you return: Absolutely. Sending my niece, Megan your way for the same trip. Would you recommend this resort? YES absolutely. How did you find our service? Helpful and attentive. Daniel on the Punta Cana side was very helpful and gave good advice. Are you satisfied with the service provided and received? Tremendously so! Would you recommend our service to your family or friends? YES absolutely, see above. Any additional comments: This was my first trip, I was so pleased with the accomodations, the staff, and the arrangements. The airports were crowded but the lines moved quickly and the personnel were friendly and efficient. I would definitely encourage others to take this trip. It is wonderful. I won't bother asking Ashley for her thoughts as they would be off the charts in a way positive mood! If this is telling of how fun the trip was, my daughter Ashley started crying as we were boarding the aircraft - she did not want to leave! It's like I told Michelle, my previous favorite trip was Negril because Michelle and I had 5 perfect weather days! This DR trip had 5 perfect days, 1 partly cloudy day and 1 cloudy day. So the most stressful part of the trip was deciding beach or pool!? Haha I'm just kidding as we usually hit the beach in the morning and the pool in the afternoon! And Ashley was so busy doing all the fun RIU Resort planned activities she wanted that often I was left alone with just our walkie-talkie connection. Ashley's day consisted of the following, awake at 8 and then breakfast and beach and the RIU activities: 1000 yoga, then 1045 club dance, then 1130 water aerobics. Then we ate lunch at noon. Then she would look for volleyball on the beach or a catamaran ride up and down the coast or join me at the pool. At 3pm was a dance lesson by the pool, followed by ping-pong at 3:30, followed by more volleyball, followed by bingo. Then we ate dinner around 6 unless if we went to the specialty restaurants. Then of course the shows in the evening! BUT WHAT ASHLEY LOVES IS DANCING TO LATIN MUSIC and every night after the show was over you could stay and dance with the workers or each other. Ashley would dance while Dad sat at the bar and kept an eye on her! We did one Apple excursion that was so worth it and one parasail! Both were totally awesome! Hard to come back to work today! The flights: The USA 3000 flights were fine. They were packed and honestly the middle seat was not so comfortable for 4 hours, but the trade-off for a direct flight was well worth it! The Flight attendants were very attentive, though $7 for a snack box seems kind of pricey. We took our own snacks on the way down. We should have packed some for the re turn trip! We had our lap-top so we watched DVDs. Our luggage (well for 6 families) did not arrive at the same time as everyone else's. The luggage man was doing his best getting people to recheck the airplane and about 15 minutes later our luggage arrived. Transfers: The delay in luggae almost made us miss our bus, but we literally caught the bus as it was pulling out of its parking spot! Beach: Walking on that coral is just marvelous! It is not like sand as it never gets hot even in the brightest sunshine! Beach was clean, palm trees positioned just right! Ashley would lay out and Dad would hide in the Palm tree shade. Pool: The pool never got overly crowded, in fact it seemed kind of empty. Dad loves the pool bar! The huts around the pool made for nice shade. The staff servicing the pool bar were really fun! One note, they really seemed to be focusing on latin music and while Ashley and I loved it, some of the other Americans were asking for some American music, but the crowd was remarkably European, Canadian and Argentinian... even a nice contingent from Russia! No one was complaining about the music except some American kids on spring break! Service: exceptional. Everyone was friendly! I noticed that at the Palace (right next door) they served drinks on the beach, but not for the Bambu guests... that was a small advantage to the palace. Also the Palace bar stayed open later, but midnight was good enough for me on most nights! And as it turned out, the younger crowd made their way to the Bambu in the afternoons... the Palace crowd is more my wife's speed. Food: Each of the 3 restaurants were clean and well staffed. I really didn't think the food was all that better than the main buffet restaurant, but the atmosphere was a very nice change. Rooms: The rooms were cleaned everyday almost impeccably. The TV is not an HDTV like you might see at a Hilton, they didn't have ANY ESPN (big downer for me), the beds were ok and the shower small. But really, we hardly spent any time in the room except to sleep after midnight until we woke up. Refrigerator was kept stocked. Ours was a little bit of a hike from the beach... I counted 180 walking strides. Haha So it was nice. Clearly a step down from the Palace facilities (newness), but much please in being able to walk up 1 flight to the 2nd floor and not have to wait for an elevator! Entertainment: I thought two of the nights the show was kind of weak, but Ashley loved them. The activities planned for morning and afternoon were very well done! Kept my daughter so happy! And all the workers were very friendly! We even tried the dance club, Pachha that supports all he RIU's. They told us to not go until after midnight, and sure enough the place didn't get hopping until about 1AM! Absolutely would return and I would Positively! recommend this resort! Your service was excellent as Always! I just recommended a friend of mine on the base was looking to go but travel for his family of 5! I think I pretty much summed everything up! Except we did do an excursion, the Bavaro Splash through Apple ($150 for the both of us). It was awesome! Ashley got to drive a speedboat, then Snuba and the snorkel! We ended up buying the DVD of the adventure! And we also did parasailing. The Apple guy was selling for $75 but Ashley met a guy who took us out for $60! It was fun too! THANK YOU! I WOULD LIKE TO THANK YOU FOR YOU HELP IN PUTTING TOGETHER ANOTHER WONDERFUL VACATION IN PUNTA CANA. EVERYTHING WENT PERFECTLY. 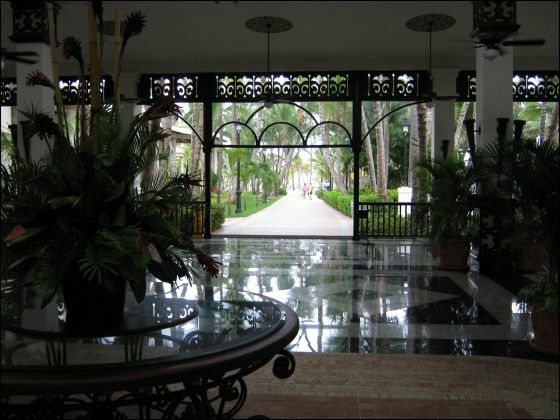 RIU BAMBU IS A VERY NICE PLACE AND WE ALL SAID WE WOULD GO BACK THERE IN A HEART BEAT. WE ARE ALL LOOKING FORWARD TO OUR DR VACATION NEXT YEAR. BY THE WAY I GAVE MY DENTIST YOUR BUSINESS CARD. HOPE HE CAN THROW SOME BUSINESS YOUR WAY. Just wanted to tell you that our annual group trip was GREAT as all have been for the past 5 years! You guys really know your stuff! This year I was not using crutches, wheelchair, and a cast on my ankle so I truly enjoyed the beach, the water and the thrill of being able to just move on my own. We all in our group were pleased with the hotel. Everything was clean and up to date. We had a problem with our in room refrigerator and it was fixed within the hour of our arrival. It was also nice that the hotel was able to accommodate the request you sent prior to our arrival, to have all of our rooms together. That makes it more convenient when going to dinner and waiting for all parties to assemble. I thought the bartenders were more "classy" than where we were last year and more accommodating about fixing certain drinks which might require a bit more work than just pouring something from a bottle. Thanks so much for the gift to our room all others in our group. That was a nice touch at the end of the day! Looking forward to next year's trip! garbage on the ground, never saw any garbage can overflowing or anything like that. Every morning the crew was out picking up leaves, sweeping the sidewalks, manicuring the trees and lawn. The entire staff at the Riu was exceptionally nice. We read some reviews on Trip advisor about the keeper of the towels. We had a little run in with him on the first day. After that, he went out of his way to make our stay enjoyable (including getting us seats near the pool with fresh towels each day). 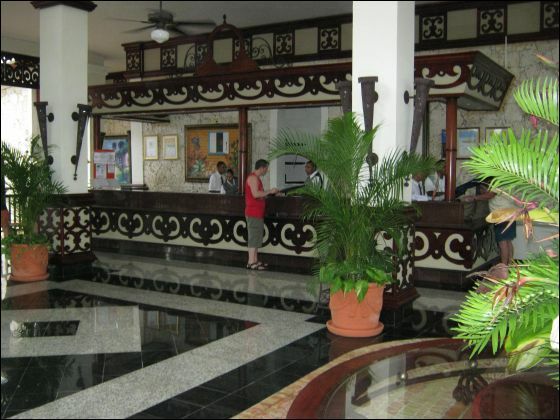 The resort held a lot of guests, and was limited on space in the common areas (i.e. pool, beach, buffet and entertainment area). Often times we had to stand for the shows at night, we saw many guests that had to sit on the beach or on the sidewalk near the pool because there weren't enough chairs (we are early birds so we lucked out). trip I had trouble finding things I didn't like. Everyone in the group (there were 15 of us) all enjoyed the food. The specialty restaurants were awesome. There were 3 and we ate at all 3 and one of them twice. The wait staff was exceptional and food was fantastic. 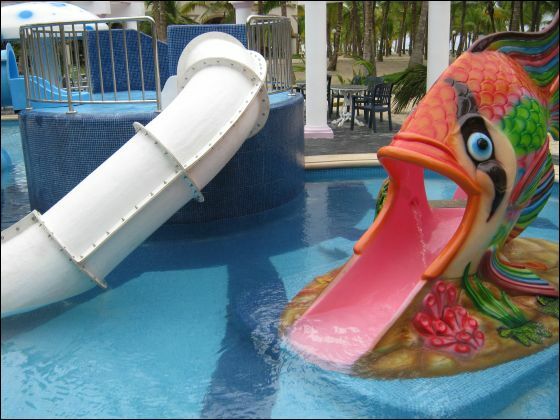 I would highly recommend this to anyone visiting the Riu Bambu. The Bambu had 3 bars (one was a swim up). 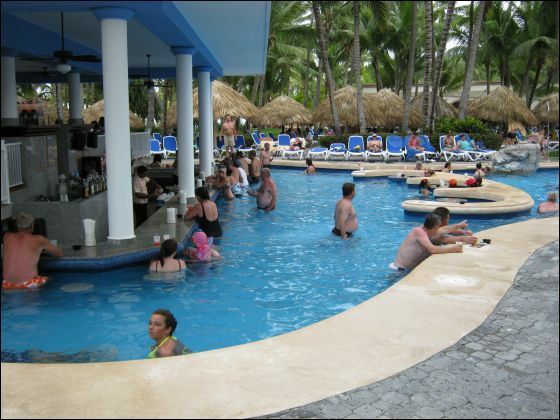 With the amount of people in the resort it was often difficult to get to the bar to get a drink. This was no fault of the bartenders, just another limitation of space. One suggestion would be to add a second bar in the area with the stage and possibly one on the beach. The entertainment needed some help. The staff themselves were great, when they were there. There were 6 or 7 of them at all times, but they were only around for an hour or so in the morning, then they did water aerobics (well, 2 did the aerobics, one played the music and the others sat around). They came back at 3 or 3:30 for a quick pick me up of music and a dance, then disappeared again until 5. When they played their 'crazy games' everyone had fun. However, they didn't do a very good job at recruiting players for these games, and it was usually the same group of people. My other suggestion would be to have the resort play more up-beat music at the pool. There were many days where we did not hear any music, and when we did it was slower music. When the animation group came out, they played faster, more up-beat music that got your feet tapping and made it a better atmosphere all around. However this only last for about 15 minutes and then they were gone. I had a great time and really enjoyed the resort. Often times when we look for feedback we are looking to make things better. I am trying to identify the areas I thought needed some improvement. But in all honesty - everything else was great. minute' deal is getting tougher. Hi there! As promised, here is a complete personal review of our trip to Riu Bambu. Flights: Both our departing and returning flights were on time. As usual, the USA3000 staff were very friendly and professional. Transfers: The transfer bus to the Riu Bambu was quite efficient! The apple reps quickly loaded our baggage and we were seated on a brand new air-conditioned bus. When we arrived at the hotel, we were very surprised to see Frank meeting us in the lobby with cold beer! That was a great start to our vacation and very thoughtful of you. 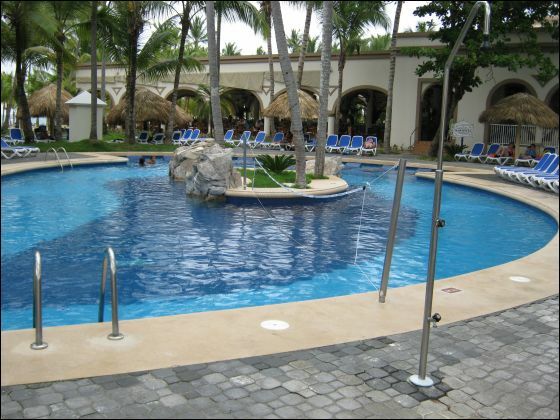 Pools: Although there are two pools at the Bambu, we mostly swam in the main pool. 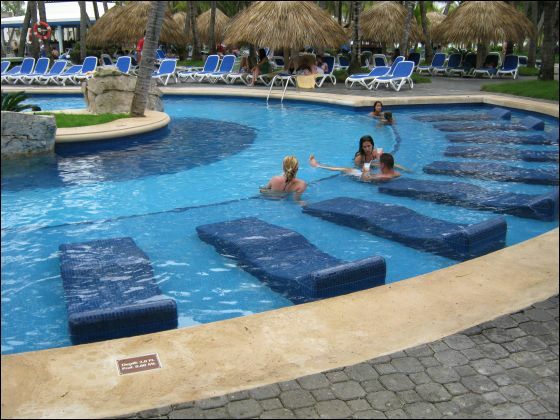 It was a large pool with a swim up bar, and there were many water activities throughout the day. The pool area in general was very busy - lots of games and music. Food: The food was probably my least favorite aspect of this resort. There was not much variety - breakfast and lunch was practically the same everyday. The pizza, however, was very good. We ate at the buffet most nights for dinner, but we also tried two of the ala carte restaurants. I ate steak twice and the meat was a bit tough. Also, I missed having a soft-serve ice cream machine! Service: Service during meal times varied - sometimes the servers were very fast and efficient, other times the service was slow. The bartenders were really great! There were several that we made friends with the very first night, and they continued to mix wonderful drinks throughout the week for us. 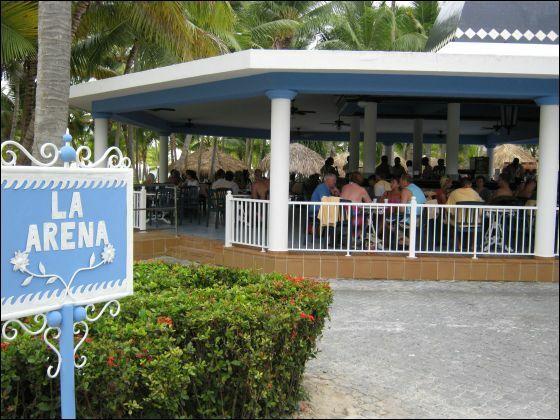 The main bar - "Bar Plaza" was very lively at night, and the bartenders were exceptionally entertaining. 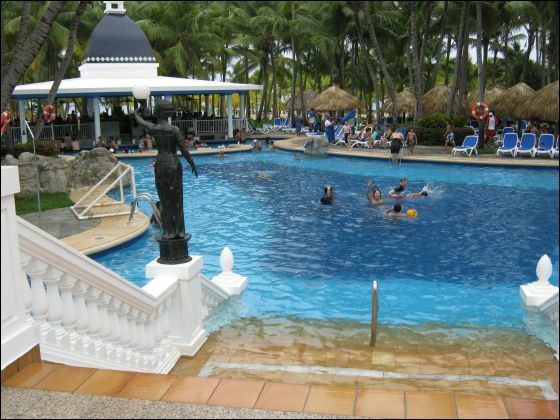 Rooms: Before traveling, I read several negative reviews online about the rooms at the Riu. I did not find any of the reviews to ring true upon our arrival. The room was beautiful and very clean. I especially liked the mahogany trimming on the closet doors and furniture. Every day the housekeepers would fold towels into birds, boats, etc. - which was a nice touch. Beach: As Frank had mentioned earlier, this was by far the BEST beach we have ever been to. The water was amazing and the sand seemed to stretch for miles. The chaise lounges were plentiful and we never had a problem finding some. Entertainment: There were shows nightly, but they weren't really geared towards the younger crowd. We went down to watch the shows twice, but they didn't seem to catch our interest. Aside from the shows, the bar was the only other source of nightly entertainment. A piano bar or disco would have been more appealing to us. Overall: We had a fantastic time this year. I was a bit skeptical at first because of the price - which seemed too good to be true. We were very pleased with our vacation - another great experience with our FAVORITE AND ONLY TRAVEL AGENTS!